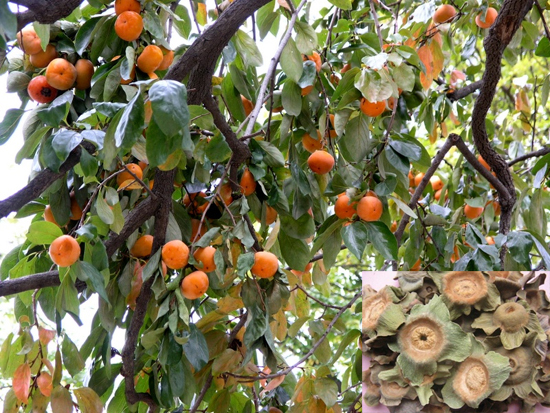 Common Name: Kaki calyx, Persimmon calyx, Persimmon calyx and receptacle. Part Used & Method for Pharmaceutical Preparations: The calyx is gathered in August or September and dried in the sun. Functions: To direct qi downward and stop hiccups. 1. For hiccups due to Cold in the Stomach, it is used with Flos Syzygii Aromatici (Ding Xiang) and Rhizoma Zingiberis Recens (Sheng Jiang) in the “Calyx Kaki Decoction” (Shi Di Tang). 2. For hiccups due to Stomach Heat, it is used with Rhizoma Phragmitis (Lu Gen) and Caulis Bambusae In Taeniis (Zhu Ru).Dosage: 6-10 g, decocted in water for an oral dose.